I thought I'd gotten off easy. No nausea. Mild fatigue. Turns out I can even pull off short hair. (I was told I look French with this even shorter haircut at left. Thoughts?) Chemotherapy isn't so bad, I thought to myself. 1. I cannot drink coffee. Coffee. If there is anything in the world I'm addicted to, it's coffee. Not only physically. I'm convinced it's overwhelmingly psychological. But that only makes it worse. I'm entering my second month of four months without coffee. Will I make it? Only time will tell. 2. My immune system is so shot that I'm stuck in the house. Not only can I not travel, which sounded bad enough, but I can't go out and be around people. I'm an explorer by nature. I'm used to getting on a plane every couple of months. When I'm in town, I'm trying out a new cafe for writing or stopping in front of a random art exhibit in someone's front yard in Berkeley. Well, not this fall. But I'm also never one to dwell on the curve balls life throws my way. After a small amount of moaning and planning future travels that seemed quite far off, I decided I'd bring the adventure to me. Last week, I bought a Lensbaby Composer, a selective focus camera lens that allows you to pinpoint the spot in an image you want to highlight and also focus ridiculously close to objects. That latter point is rather important when one wants to make an adventure out of one's house. The lens arrived earlier this week. Here are a few of my first shots. 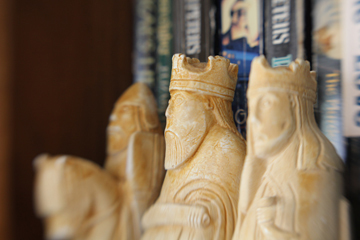 Three Lewis Chessmen sit on my bookshelf. The Lewis Chessmen are the famous pieces found in Scotland's Outer Hebrides a couple hundred years ago that scholars believe to have been originally carved in the 12th century. They're so fascinating because each of the dozens of pieces have unique, often humorous, facial expressions. I made these three pieces out of a plaster cast when I was a kid. 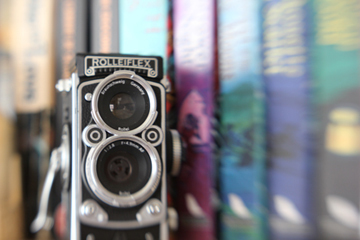 A miniature version of the classic Rolleiflex camera. 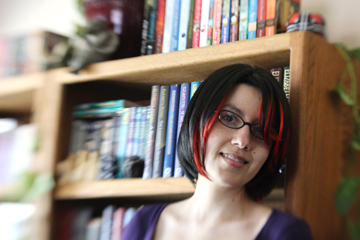 Self-portrait in front of my favorite bookshelf. Being denied something makes me hunger for it all the more. Good job of making something positive out of a negative. Love the shortshort hair and the pix. Holy Guacamole, Gigi, but you rock even the super short hair. Gorgeous! And those photos--LOVE them. Can't wait to see what else you find in your house during your incarceration. Gigi minus coffee? Hope this fall passes quickly then! Gorgeous. All of this, the photos, you, all of it. Thanks, all. In spite of my lack of coffee I'm managing to continue to have fun with the new lens. Wow, Gigi. This is incredible. I ADORE your photos! 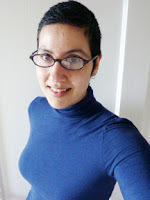 And the short hair --very French! Thinking of you always, hoping you're released from your home confinement soon!